Fifth-placed Fylde now have a four-point cushion in the National League play-off zone but have claimed only two points from three games since winning through to the FA Trophy final. The Coasters made one change from Saturday’s goalless draw at Aldershot Town, with Dan Bradley returning to the midfield after a calf strain in place of Andy Bond. An open start saw the visitors look to play the ball in the air, while the Coasters opeted for their usual passing style. The first real chance came from a wonderful move, which saw James Hardy and Nick Haughton combine to find Bradley on the edge of the box. He found Arlen Birch, whose low ball across the face of goal was turned goalwards by Bradley but alert keeper Elliot Justham denied him a first goal of his second Coasters spell. But despite Fylde’s early dominance it was the Daggers who took an 18th minute lead, when Matt Robinson’s deflected header caused bedlam in the home defence and Angelo Balanta reacted quickest to fire past keeper Jay Lynch. The Daggers protected their lead resolutely with a back five frustrating Fylde and many more players behind the ball. Fylde had their work cut out to beat this red and blue wall. Birch often found space out wide but his final ball was lacking on occasions. A long ball to Rowe was knocked down for Bradley, whose explosive run was halted when he was brought down on the edge of the box five minutes before half-time. Rowe’s free-kicks on Saturday had not really troubled Aldershot but this one couldn’t have been more different. He shot low and powerfully into the bottom corner for his 26th league goal of the season. The goal was probably a just reward for Fylde and meant the Daggers came out of their shell at the beginning of the second half, with Balanta often the target. The number 10 did well to fashion a chance for team-mate Will Wright but his angled effort was saved well by Lynch. Rowe rolled his marker to set up a solid chance for Bradley, whose effort flew well over. Hardy and Haughton were next to combine, the latter’s shot taking a heavy deflection for a corner. Fylde made an attacking change for the final 25 minutes as Alex Reid replaced Zaine Francis-Angol. The Coasters responded well to the change, Rowe holding play up brilliantly but Bradley’s dangerous low cross was well cleared. Rowe then found Haughton advancing towards goal but the attacker couldn’t wrap his foot around the ball and his shot flew wide. It was becoming another night of missed chances for Fylde as Haughton linked up with Ryan Croasdale to release Bradley, whose rushed effort skewed over the bar. Fylde were desperate for a slice of luck, and almost found it as Haughton’s low effort was nearly fumbled into his own net by Justham but the keeper recovered before it was too late. The Fylde management team looked confused to say the least when captain Neill Byrne was accused of elbowing and shown a second yellow card on 89 minutes. 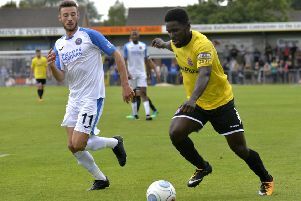 The game trundled to a disappointing close from there, though Fylde lost no ground as the other promotion chasers playing games in hand last night both lost – leaders Leyton Orient and the Coasters’ Saturday opponents Eastleigh. 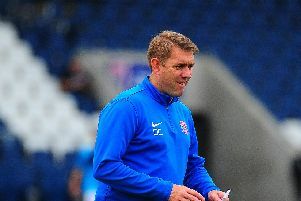 Frustrated Fylde manager Dave Challinor said: “I’m disappointed with our performance as we knew how they’d set up.